1. Sign up for NaNoWriMo’s Young Writers Program. Be sure to register as an “Educator” and remember your password and security questions. IMPORTANT DETAILS: You must be a parent or an adult facilitating the Young Writers Program in a school, library, or community space. If you are not a a parent or an adult faciliator, you are not permitted to establish an account. Go to your Profile & Settings to upload an avatar and fill in as much profile information as you’d like. 3. Use our Educator Resources. We’ve got student workbooks, Common Core-aligned lesson plans, and a free classroom kit to help you inspire your kids before, during, and after November. You can also connect with fellow educators in our forums. 4. Create your virtual classroom(s). Our on-site classroom space allows you to hold class discussions, monitor students’ novel progress, read and edit students' novels, and set class-wide writing challenges separate from official NaNo events. Click “Create my classroom” on your dashboard to get started. You can create as many classrooms as you need (for instance, for multiple sections or grades), and manage them all from the Dashboard or View All Classrooms page. IMPORTANT DETAILS: If you are facilitating the Young Writers Program for students under 13, you must also review and agree to a Parent Proxy Agreement. 5. Enroll students in your class with a unique classroom code. Students can join your classroom automatically by inputting your classroom's unique access code when they sign up for Young Writer accounts (if they enroll this way, they don't need personal or parent email addresses). They can also join your classroom after they've signed up by clicking the "Join a classroom" link on their dashboard and inputting your classroom's access code. Your classroom's access code is found in the Classroom Admin area of each class's page. IMPORTANT DETAILS: Please review the Terms & Conditions and Parent Proxy Agreement before you allow students to establish accounts. 6. Help students create their novels. IMPORTANT DETAILS: The main NaNoWriMo event happens each November. Camp NaNoWriMo occurs every April and July. You can start a class-wide writing challenge any time. 7. When the challenge begins, students start writing! Their stories matter. And for 30 crazy, exciting, surprising days, they get to lock away their inner editors, let their imaginations take over, and just create. When students use our on-site writing space, we automatically count their words and award them badges for days-in-a-row and percentage completed. When they write somewhere else, the stats update when they input their new word count. Go to the Classroom Admin area to see how students are doing, and even click through to read their novels. IMPORTANT DETAILS: Students can write their novels anywhere and update their word count manually. That option can be set and changed in novel settings at any time. 9. Keep your students motivated. Be sure to provide space and support for their creative efforts. For small bursts of inspiration, try out the Dare Machine or Writing Sprints, found to the left of the writing space or from the novel box on the Dashboard. 10. Students write until the very end. If they reach their word-count goals by 11:59:59 PM on the final day of the challenge, they’ll be declared NaNoWriMo winners and get a few goodies to celebrate. Be sure to celebrate this amazing month of noveling—no matter where students end up in their word counts! IMPORTANT DETAILS: The main NaNoWriMo challenge ends November 30. 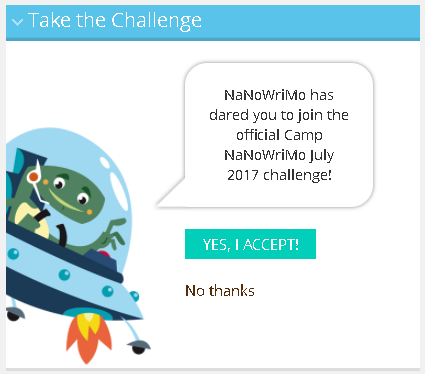 The Camp NaNoWriMo challenges end April 30 and July 31. Print your students' novels with our self-publishing partner, Blurb. Use the PDF download from the writing space for a simple process, or get creative. Read our how-to suggestions, or publish your novel now. Students’ novels will remain on our site as long as they keep their accounts. Bring back your class to continue writing and editing. In January and February, we support the process through our “Now What?” Months. Students can create new projects throughout the year, with personal challenges, classroom challenges, and site-wide events like Camp NaNoWriMo in April and July or Short Story Month in May. Learn more about writing year-round. Our forums remain open and active all the time. You can also find us on Facebook, Instagram, YouTube, Twitter, and Tumblr. Read more on on our Help & FAQ page.